Join us this weekend for the Kansas Sampler Festival at Island Park, in Winfield, KS. This will be our third year to perform at the Sampler, and we are hoping for excellent weather! 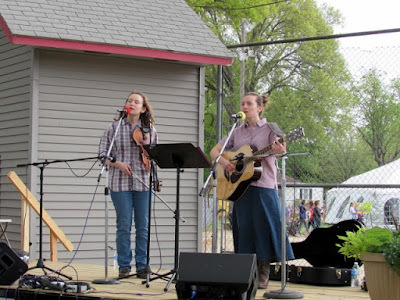 We will perform on Saturday, May 7 on the Meadowlark Stage from 3-3:45 PM. On Sunday, we'll be at the Sunflower Stage from 12:15-1:00 PM. Gates open at 10:00 AM both days, with a $5 entrance fee. There will be a Festival Music Crawl downtown on Friday night. Please note that we will NOT be performing Friday night in Winfield--sorry!